With it's rich flavor and juicy meat, duck makes a decadent addition to your diet. Overall, duck is fattier than many other types of meat, so opt for skinless breast meat to help limit your fat intake. Consume duck as a source of nutrients, and enjoy the health benefits associated with its nutritional value. A 3.5-ounce serving of duck breast with the skin removed supplies 140 calories. If you also eat the skin, the calorie count rises to 202 per serving. This is similar to turkey, which supplies 135 calories in the same serving of breast with skin removed; it is less than the calories in this size serving of beef round, which is 191 calories. 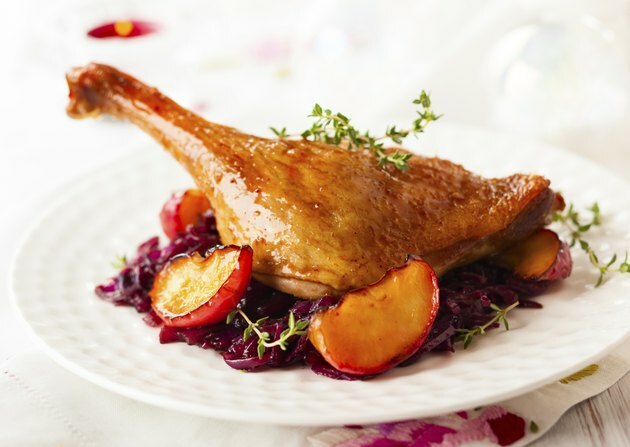 A serving of duck leg has slightly more calories than the breast, 178 calories per serving, according to the USDA database. Duck breast without the skin is very low in fat with 3 g per serving. A serving of duck leg contains more fat with 6 g per serving; either serving with skin supplies 11 grams of fat. Duck breast is slightly higher in fat than turkey breast, which contains just 0.7 grams per serving. The current daily dietary recommendation for total fat is no more than 30 percent of fat, or 90 grams if you consume a typical 2,000 calorie a day diet, with 10 percent, or 30 grams from saturated fats, according to the Merck Manuals Online Medical Library. Eating the leaner parts of the duck, even if you consume the skin, will keep you within your daily limits. The fat in all meats consists of both saturated and unsaturated fats; duck breast contains 0.6 grams of saturated fat, 0.9 grams of monounsaturated fat and 0.4 grams of polyunsaturated fat. Duck also contains 143 milligrams of cholesterol in the breast and 105 milligrams in the leg; the daily recommended cholesterol intake is 300 milligrams. Duck, like other meats, contains no carbohydrates but is an excellent source of protein. Most meats contains contain roughly the same amount of protein; a serving of duck breast supplies 28 grams of protein compared to 29 grams for a serving of duck leg. The daily protein recommendation for protein intake is approximately 60 grams per day, the Merck Manuals reports. Duck is an excellent source of a number of vitamins and minerals. A serving of duck breast supplies 4.5 milligrams of iron, or 45 percent of your daily requirement, according to the USDA, while a serving of duck leg contains 2.3 milligrams, or 23 percent of your daily 10 milligrams iron requirement. A serving of duck also supplies 29 micrograms, or 41 percent of your daily requirement for selenium. The leg contains 22 micrograms, or 31 percent of your daily requirement. The breast is also a good source of the recommended 19 milligrams per day of the B-complex vitamin niacin, with 10.4 milligrams, or 54 percent in the breast and 5.3 milligrams, or 28 percent in a serving of leg.